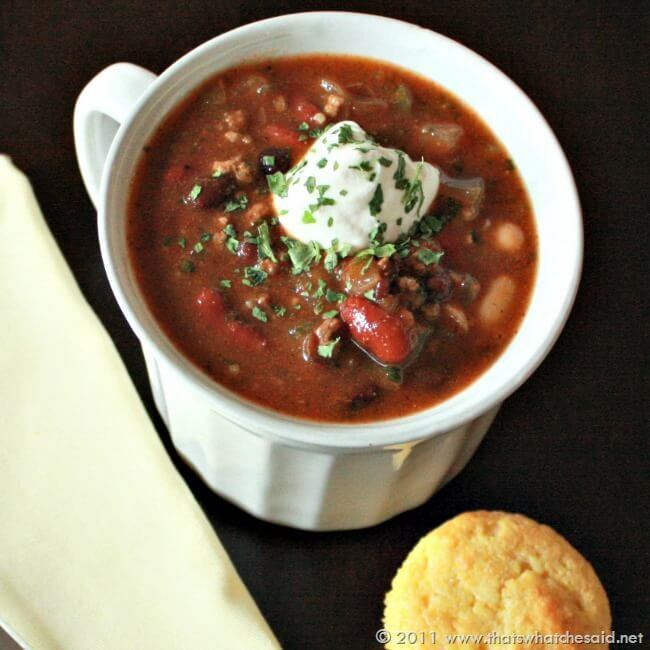 This delicious and hearty chili recipe contains three different kinds of beans so it’s sure to fill the hungriest of stomachs! It’s packed with flavor and the fresh cilantro adds the perfect bit of freshness to the dish! In true chili fashion, it’s even better the next day! This recipe can easily be made in your Crock Pot as well as stove top! This recipe has become a favorite of my family’s and everyone I share it with! I will even go so boldly as to say my 3 bean chili recipe is famous. I might even go so far as to say it will become your favorite…yep, it’s that good. I am not full of myself, I only make these claims because everyone who eats my chili LOVES it and requests the recipe. Like to the point of hounding me down for it. Seriously..here it is get off my back!!! I have had people rearrange travel plans before just to partake in the chili goodness. Brown ground beef and add salt/pepper (large pinch of each). Drain fat. Set meat aside (in colander works great). Add 2 tablespoons of Olive Oil (enough to coat bottom of pot) and add onions and green peppers and another pinch of salt/pepper. Stir over medium-high heat until onions are translucent. Add garlic and stir for another 2 minutes. Add meat back to pot. Add Chicken broth, chili powder, cumin, onion powder, grill seasoning, tomato paste and bring to boil. While waiting for the boil, drain and rinse all 3 cans of beans. Serve with a dollop of light sour cream, corn bread and your favorite fixings! *If making corn muffins also, I use 2 tablespoons of corn muffin mix in place of cornmeal, if I don’t have cornmeal on hand! 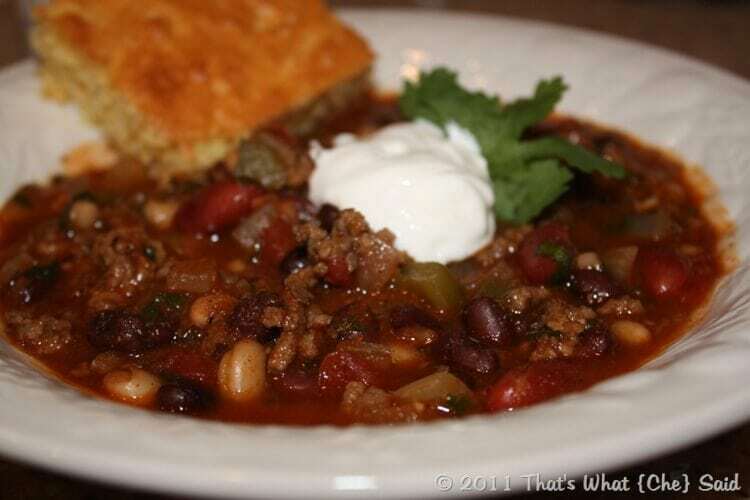 You can top this delicious chili with your favorite fixings! I prefer a bit of cheese, a dallop of sour cream and some more fresh cilantro on top. Some other crowd favorites have been onion, jalepenos, gold fish crackers (can you guess who loves those?) peperoni and some oyster crackers! 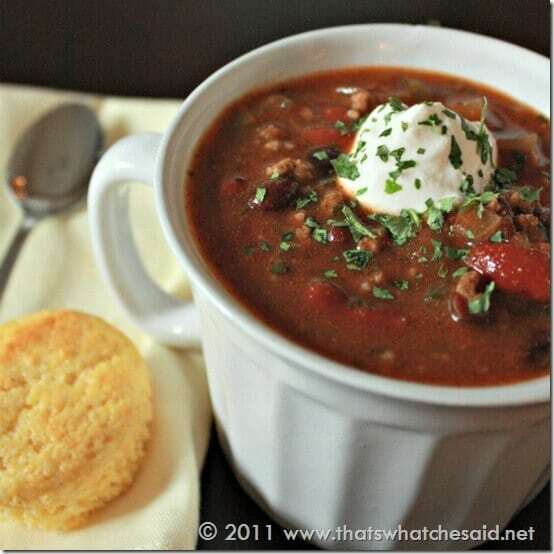 What are your favorite toppings to add to your chili to make it your own famous version?? I’d love for you to check out all my RECIPES while you are here! I am sure there is something you will LOVE! This chili IS amazing! I was going through my recipe box and threw out the ones I didn’t want any more. When I went back to make this and found it was gone, I think I had a mild stroke! Thanks for resending it! It wouldn’t be fall without it! Hope all is going well with those adorable children of yours(hubby included)! I love chili but have never made it! Thanks for the recipe and for sharing it this week! Can you do this in a crock pot? If so,I would love for you come link this up to The CSI Project this week starting wednesday at midnight. It is the slow cooker challenge and this is perfect. Made this in my crockpot and is really nice added a small chili pepper for some bite..will take some for my daughter to have. Mmmm! The chili pepper sounds great!! I love some heat!! !